Get the Glow, The Bikini Body, Strong Immunity, More Energy and Stay Warm with Super Energising Living Foods this Winter! 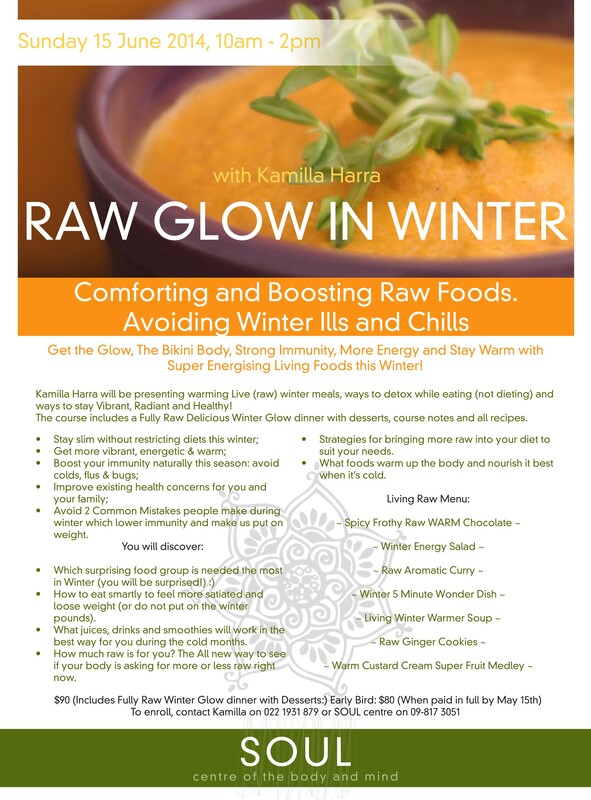 Kamilla Harra will be presenting warming Live (raw) winter meals, ways to detox while eating (not dieting) and to stay Vibrant, Radiant and Healthy! The course includes Fully Raw Delicious Winter Glow dinner with desserts, Course Notes, All Recipes. avoid 2 Common Mistakes people make during winter which lower immunity and make us put on weight. How to eat smartly to feel more satiated and loose weight (or do not put on the winter pounds). What juices, drinks and smoothies will work in the best way for you during the cold months. How much raw is for you? The All new way to see if your body is asking for more or less raw right now. Strategies for bringing more raw into your diet to suit your needs. What foods warm up the body and nourish it best when it’s cold. Date & Time: 15 June 10 a.m. – 2 p.m.